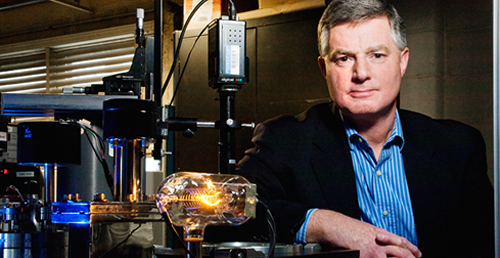 Professor J. Gary Eden was elected to the National Academy of Engineering for his work in micro-plasma and laser technologies. CHAMPAIGN, Ill. - J. Gary Eden, the Gilmore Family Professor of electrical and computer engineering at the University of Illinois at Urbana-Champaign, has been elected to membership in the National Academy of Engineering. Eden is among 67 new members and 11 foreign associates announced by the academy on Feb. 6. Election to the NAE is one of the highest professional honors an engineer can garner. The 2,250 members and 214 foreign associates are an elite group distinguished by their outstanding contributions to the fields of technology and engineering. "It is wonderful to see such significant recognition of the advancements in micro-plasma and laser engineering that have come from Gary Eden's work," said Ilesanmi Adesida, the provost and vice chancellor for academic affairs of the Urbana campus. "The strides that he has made in both furthering basic science and developing practical applications exemplify the research mission of the University of Illinois at Urbana-Champaign." Eden, who uses lasers to study how visible and ultraviolet light interact with matter, was honored "for development and commercialization of micro-plasma technologies and excimer lasers." His work has led to advances in multiple areas of application. For example, excimer lasers, a class of ultraviolet lasers Eden developed, are used industrially in semiconductor manufacturing and clinically for eye surgeries. His work also has advanced such areas as ultrafast spectroscopy, which uses laser pulses to study the interactions between atoms and molecules, and photochemical vapor deposition, which uses lasers to deposit thin films of semiconductors and other materials on a surface. Eden is an alumnus of the U. of I., having earned his Ph.D. in electrical engineering in 1976. He worked at the Naval Research Laboratory before returning to Illinois as a faculty member in 1979. He is a fellow of the American Association for the Advancement of Science, the American Physical Society, the Institute for Electrical and Electronics Engineers, the Optical Society of America, and the SPIE (the international society for Optical Engineering). He also is affiliated with the Coordinated Science Laboratory and the Micro and Nano Technology Laboratory at the U. of I. To contact J. Gary Eden, call 217-333-4157; email jgeden@illinois.edu.